Looking for the perfect place to hold a family gathering or celebrate a special event with friends? Whether it’s a family birthday, anniversary or hen party our holiday cottages are ideal for a group getaway! Our Pippenwell and Red Hurst cottages in the Peak District sleep 6 people each and can be made into one large space for a group to enjoy. 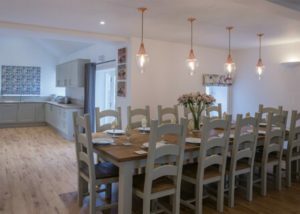 The two cottages are attached and can each be accessed by an adjoining door which opens into the spacious Red Hurst dining room which has a fantastic feature dining table to seat 12, perfect for a celebratory meal! Both characterful cottages are immaculately furnished with quality kitchens and bathrooms. 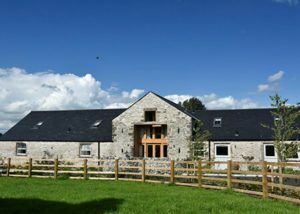 There is also a pretty courtyard with seating for alfresco dining, as well as a private patio area that has access to farmland and grounds to explore. There’s plenty to keep everyone entertained! Set in the heart of the Peak District, there’s lots to see and do If you feel like getting out and about. Renowned for its spectacular scenery the Peak District is perfect for outdoor activities such as walking and cycling. Within close proximity we also have the Church Inn at Chelmorton, which is in walking distance of Farditch Farm. Located near the picturesque towns of Bakewell and Buxton, there’s plenty of local attractions to keep you entertained, such as the beautiful Chatsworth House which hosts an array of seasonal events. And be sure not to miss the Bakewell Farmers Market, every last Saturday of the month, for superb local produce and crafts. And if you just want to chill out after a day’s walking, both cottages have WiFi and flat screen TVs so you can kick back and relax. Contact us to find out more and book your stay. And don’t forget all of our cottages are dog friendly, so your four-legged friends can enjoy the party too!